PROVO, Utah -- Hugh Nibley was dying. BYU professors Michael D. Rhodes, John W. Welch, John Gee and others met at Nibley's home to decide what to do with his unfinished book, "One Eternal Round." Nibley was at home, but was unconscious. The amount of work needed to complete the book was massive. Rhodes and the others knew that the only way to finish Nibley's exhaustive examination of Facsimile 2 in the Book of Abraham was to have one person take the project on. "As we all looked uncomfortably at each other, no one, at that point, was willing to commit to doing it, and so we adjourned without making a final decision," Rhodes said on Thursday, April 8, at the final installment of the Neal A. Maxwell Institute's weekly lecture series that honored the late Professor Nibley. Rhodes couldn't shake the thought throughout the rest of the day: "Mike, you got to do this." "Finally, sometime in the middle of the night, a sense of calm came over me, and I realized this was something I had to do and could do," Rhodes said. "I would finish this book for Hugh." Early that next morning, Feb. 24, 2005, Hugh Nibley died. "I firmly believe that once I had made that decision, Hugh somehow knew it and felt he could leave this life, assured that his book would be finished," said Rhodes, an associate research professor in BYU's department of ancient scripture. Rhodes' interest in things Egyptian began at age 9 when he noticed Facsimile 2 in the Pearl of Great Price -- a round drawing with mysterious figures. "I felt a burning desire to learn Egyptian so I could read those characters," Rhodes said. Rhodes had just returned from a Mormon mission and was studying at BYU when several portions of the Egyptian papyrus that had belonged to Joseph Smith were discovered. Rhodes approached Nibley to see if he would teach a class on Middle Egyptian. Nibley did and a friendship began. After graduation, Rhodes studied Egyptology with Professor Hans Goedicke at John Hopkins University. Goedicke lost patience with Rhodes' interest in Joseph Smith and the Book of Abraham. "On several occasions I would go to him and say 'Look at this! Joseph Smith said this and it's right.'" Rhodes said. "And his response was always, 'Lucky guess!'" After three years, Goedicke told Rhodes he could never be a good Egyptologist because Mormons could not be objective enough about the subject. Nibley encouraged and mentored Rhodes throughout his career. He wrote Rhodes about Goedicke's attitude: "Goedicke's obvious annoyance at your independence is the best guarantee that you are really going to produce something. ... I have never been 'objective' and never will be. ... Don't weaken -- you may be the world's last, as I am the world's worst, scholar." Rhodes career took him to the Air Force, which took him to many different places near many different universities. He studied science or the ancient world, depending on what was available -- including more Egyptian at Freie Universitat Berlin. Again Nibley encouraged him: "Three cheers! The path of genius is a rough one, and I glory in my safe mediocrity." After 17 years in the Air Force, Rhodes wrote to Nibley that he hoped to teach at BYU when he retired in three years. "You can imagine how elated I am at the news," Nibley wrote back. "I will try to hang on until you get here, but you MUST come!" Rhodes came to BYU in 1993 and, among his other duties, helped Nibley with his next big project, a book to be titled "One Eternal Round." Nibley renewed an interest in Egyptian in the late 1950s while researching in the library. Rhodes said Nibley "received a prompting that he should go back to (his old graduate school at) Berkeley and study Egyptian." Nibley studied Egyptian under Klaus Baer from 1959 to 1960 at Berkeley and 1966-67 at the University of Chicago. In 1967, the Joseph Smith papyrus fragments were found, beginning 40 years of Nibley's work on the Book of Abraham. Rhodes divided those years into four phases. Rhodes called the first phase "preliminary studies." Nibley concentrated on how the Book of Abraham matched many ancient sources that were not available to Joseph Smith. He published "A New Look at the Pearl of Great Price." Rhodes said some of Nibley's conclusions are dated -- such as the idea that the Egyptian sed-festival had human sacrifice -- but he was using the best sources available at the time. 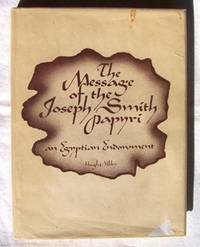 During this phase, Rhodes said Nibley worked on Joseph Smith papyrus fragments I, X and XI -- Facsimile 1 and portions of the Egyptian Book of Breathings. Nibley found parallels with the Book of Breathings and LDS temple ceremonies. Again, Rhodes said some of his findings are dated. However, Nibley's identification of the Book of Breathings as an "initiation text" -- which was radical at the time -- is widely accepted today. Nibley's contention that funerary texts were also used by the living is also "part of mainstream Egyptology," Rhodes said. This phase was marked by the book "Abraham in Egypt," a collection of evidence from many ancient sources about Abraham's life, from Egytian to Islamic. "To Nibley," Rhodes said, "the real value of the Book of Abraham is the eternal truths it teaches us." This phase brings us back to "One Eternal Round." Rhodes called it Nibley's "magnum opus" and his "swan song." When Rhodes decided to help complete the book, there were more than 30 boxes of papers, notes and pictures. There were more than 450 computer files. Some chapters of the book had more than 20 different versions. "As I sifted through the enormous mountain of material that comprised Nibley's work on 'One Eternal Round,'" Rhodes said, "my chief goal was to remain true to Hugh's purpose. ... This was Hugh's book, not mine, and I made every effort to keep my editing and writing at a minimum." One thing that was not included was a complicated mathematical examination of the pyramids. Rhodes and his colleagues couldn't figure it out. "If he were here to explain it, he probably could have explained what he really meant." One thing that was added was a reference to an early stone-age temple complex recently discovered in Turkey -- supporting Nibley's contention that temples go back to the very beginnings of time. The book's sweeping scope, its mining of sources -- mathematics, Alexander the Great, Egyptian pharaohs, medieval Jewish Kabbala, ancient Hermeticism, Greek myths, Christian apocrypha, ancient Chinese jade disks, Aztec calendars, Egyptian mirrors, Hopi Indian ceremonies, Shaman drums and more, are all pure Nibley. And all of it is mustered to bring light to the round Egyptian hypocephalus known as Facsimile 2 in the Book of Abraham. It has been five years since that restless night when Rhodes felt a sense of calm that he could "finish this book for Hugh." Now his mentor's book is done. "It is my sincerest hope that when it comes my turn to cross through the veil, that Hugh will approach me with a beautiful smile on his face and words of approval for what I have done," Rhodes said "To paraphrase Mormon, 'And now, if there are faults in this book, they are the faults of Mike, wherefore condemn not the things of Hugh Nibley.'"